Order your own copy of the Please Stand By Gamemat at your local retailer or online through our website today! The world may have descended into chaos when the bombs dropped, but that doesn’t mean exploring this crazy world has to be equally chaotic. You can bring order to your games of Fallout: The Board Game with the Please Stand By Gamemat, available for order now at your local retailer or online through the Fantasy Flight Games website! After waiting out the horrors of nuclear devastation, you’re probably anxious to head out into the wasteland and see what’s left of the world, and every aspect of the Please Stand By Gamemat invites you deeper into the Fallout universe. With the iconic imagery as your backdrop and its expansive 3' x 3' play surface, each gamemat provides the perfect space to construct your wasteland no matter what scenario you’re playing. You’re bound to have all manner of encounters in the irradiated landscape and you’ll need a way to organize all the loot you find while you do so. Luckily, the Please Stand By Gamemat also provides convenient spaces for you to keep track of your encounter, loot, and asset decks, ensuring that they’re at hand exactly when you need them. 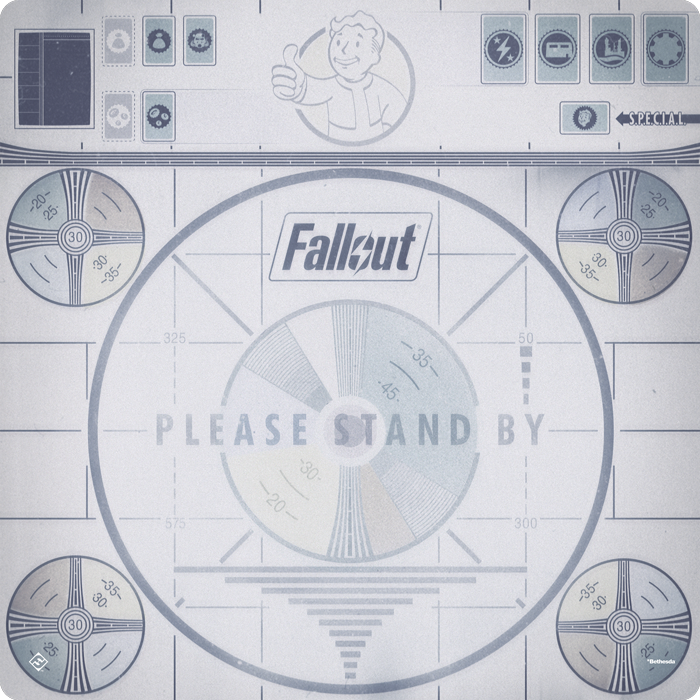 No matter where you roam in the wasteland, the Please Stand By Gamemat can help you stay on the right track. Prepare for your adventures and organize your games of Fallout today! Make your Fallout: The Board Game experience truly special with your own Please Stand By Gamemat (ZX04) available now from your local retailer or online through our website!